The company says customer data has not been affected. A Tim Hortons location in Kingston, Ont., Thurs. Oct. 12, 2017. Tim Hortons locations across the country have been hit by a computer virus that forced some locations to shut down over the past week. Tim Hortons locations across the country have been hit by a computer virus that forced some locations to shut down over the past week. The company told The Canadian Press that it started working with an external vendor last week to fix the problem. Customer data and credit card information was not affected by the breach, Tim Hortons said, and only a few locations were still affected as of Tuesday. The company told the Globe and Mail that the virus hit fewer than 100 locations, attacking the Panasonic cash registers that the chain uses. 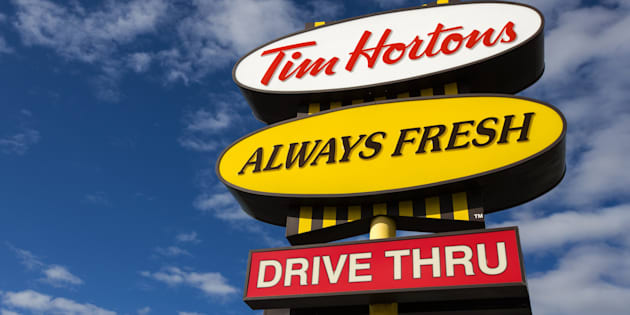 But a source close to the issue told HuffPost Canada that as many as 1,000 Tim Hortons locations may have been impacted, amounting to roughly a quarter of all Canadian locations. Some locations were forced to close, while others had to shut down their drive-throughs. In a letter obtained by the Globe and the Canadian Press, Tim Hortons franchisees belonging to the Great White North Franchisee Association asked head office for compensation for losses due to the virus. "The business interruption includes inability to use some or all of the ... issued cash registers and [point-of-sale] terminals, causing partial and complete store closures, franchisees paying employees not to work, lost sales and product spoilage," the letter from law firm Himelfarb Proszanski reportedly stated. The letter called the incident "a failure'' and noted that it comes "on the heels of the public relations debacle'' from January when two Cobourg, Ont. franchises owned by Ron Joyce Jr. and Jeri Horton-Joyce, the children of the company's billionaire co-founders, moved to offset the province's minimum wage hike by cutting paid breaks and forcing workers to cover a bigger share of their benefits. Days after the hike came into effect, hundreds rallied outside Tim Hortons locations chanting "hold the sugar, hold the cream, Tim Hortons don't be mean'' to protest Joyce Jr. and Horton Joyce's actions, while others vowed to boycott the brand. The outcry from the incident coupled with the recent hack "is causing tremendous downward pressure on the value the Tim Hortons brand,'' the franchisee association's letter said.